Canadian-American dual citizen based in Toronto, Canada. Member of The American Federation of Musicians Local 226: The Central Ontario Musicians' Association. Jennifer's musical exploration has covered vast territory. She is a multi-instrumentalist with a musical family that includes bass guitar, cello, kamel n'goni, didgeridoo, found and made objects, flutes, various percussion, berimbau, musical saw, jaw harp, and sample-based sequencing. She has performed and recorded in projects ranging from funk to folk, rock to reggae, music influenced by traditions of Africa and Celtic cultures as well as experimental projects that can draw few comparisons. Jennifer has composed and recorded for film, video, dance, theatre and multimedia projects. She has toured internationally and appeared in nationally broadcast music videos and on various local and national television shows. Jennifer recently spent six months on a retreat from Toronto in a cabin outside of Smithers, BC where she focused on exploring her musicianship with many instruments and recording gear. A collection of recorded music from this experience will be released in the near future. She has either recorded, performed and/or toured with: Anna Gutmanis, DubTonic, Rachelle Van Zanten, Los Gringos Salvajes, Bhadra Blue, Peter J Slack, The Bhadra Collective, Triund, Random Order, Brazen Crush, Dreamfire, Kelly and the Kellygirls, Roach Motel, Amer Diab, Yala (with Jamie Stone & Morgan Doctor), Evalyn Parry, celtic fiddler Eric Nagler, The Wetspots, Pam Gerrand, Tucker Finn, Lyndell Montgomery, Dropdeadbeats, The Matriphiles, Roma (with Michelle Josef, Marg Stowe & Wally Jericho), Women Ah Run Tings, Myk Gordon, Tamara Williamson, The Kitchen Sink Project, Meryn Cadell, Snowdogs, Amy Fritz and The Nancy Sinatras. 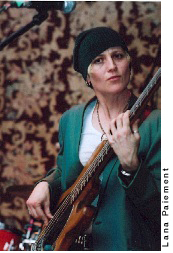 A member of AIM Toronto (association of improvising musicians toronto) Jen is an avid improviser who has performed as part of Toronto's longstanding Ambient Ping, provided live music for Tribal Dance Community, Martha Randall's Nia classes and other events with Gary Diggins. She creates soundscapes regularly for Kathleen Rea's Contact Dance Jams and also enjoys DJing for dancers at Toronto's weekly The Move. The first Sunday of each month, Jen provides musical accompaniment for Bibi Rahim-Hahn's Flow Yoga class at Yogaspace in Toronto.